I usually make the list over the course of a couple of months, adding and subtracting things here and there to see what sticks. Turns out, sometimes the things I'm dreaming of in August to wear in the cooler months aren't actually the things I really want to wear when it does in fact get cooler...the dreaming doesn't always match-up with my reality. Go figure. In the end, the ultimate goal is really to narrow down the things I'd like to add to my wardrobe, so when I do shop, I have some semblance of a plan. All that said, in the case of my fall list, it's a bit more "wish" than "reality"... I will likely not be able to actually pull the trigger on both of those Kelly Wearstler items (as much as I'm seriously loving them), and the Proenza Schouler bag is clearly a dream item, but I'm posting it in an attempt to test the notion that if you put something out into the universe and want it bad enough it will come to pass à la The Secret. We'll see how that plays out. 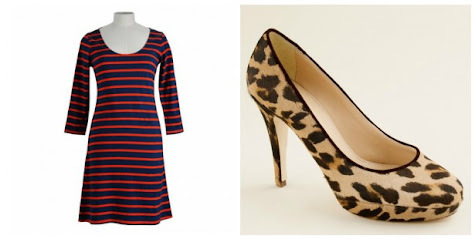 The Chance striped dress, on the other hand, will probably make it into my closet, as I wear my blue and white one non-stop (it may, in fact, be my most oft-worn item of clothing), and this color combo feels a little dressier... I'd really like to pair it with those J. Crew leopard print pumps (they're expensive, but I think I'd have them forever) and some dark skinny jeans that I already own. The black wool mini fills a gap in my closet, as I'm always lamenting my lack of one to pair with tights, boots and sweaters. 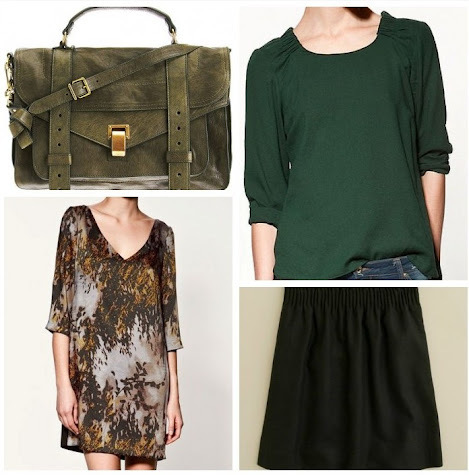 And to round things out, I'm digging that emerald green top from Zara to pair with my wide leg jeans and some wedges and the printed dress could be good with tights and the boots or over those aforementioned skinnies (+ I'm trying to work a few more prints into the closet). Last but not least, I'm dreaming of a big statement necklace, and I can't get that one from We Never Sleep out of my head...it's sculptural and totally unique -- like a little piece of wearable art. Ok, that's my list... Do you guys do anything similar? What's on your shopping list for fall? I have booties on mine, and I can't decide on the perfect pair! I want ones that are just right for me and not $300. Hasn't happened yet. oooo my birthday is coming up in a six weeks and i have been thinking about making a list. . . I saw that skirt when I was at J. Crew a week ago and I almost tried it on but convinced myself not to. Super cute though. I love the striped dress. Would you wear it over black skinny jeans, or were you saying the shoes would also go great with black skinny jeans? I bought the great dress from Talbots that you highlighted--the poets dress. Thanks for your inspiration and help! Fantastic picks! I'm apparently completely focused on accessories this fall as that seems to be one majorly neglected corner of the closet. Also, a friendly tip that might get you closer to that PS1. There is an awesome store called Zoe that carries Proenza and they offer discount codes roughly every 3 months. Usually for 20% off. The last one *just* happened a couple of weeks ago but I'd be surprised if there isn't another one before Christmas. Great list! I've been focused on buying as many classics as possible. For the first time ever I picked up 3 boots this season (I usually pick up boots in the Spring when they go on sale). I just couldn't resist (two are from Madewelll). I've been coveting a satchel with a body strap. J.Crew has a cute one. And they just sent around a promo code email (you can use it on those gorgeous shoes). Catching up on my blog reading from when I was out of town, and I just love this fall wishlist. And that PS1 is so gorgeous. I didn't really get what all the hype was about until I saw a suede one in person. Drool-worthy.